You are here because you’re an avid metal artisan looking for a crucial tool of the trade: plasma cutter. Regardless of whether you need it for domestic or commercial use, you have come to the right place. Plasma cutters allow you to make easy and light work of your metal-cutting tasks. However, a lot of the technical specifications that describe these machines are enough to make it difficult to find the right one. In this article, I’m going to reviewing the plasma cutters that are rocking the best-seller list with high ranking and positive feedback from users in 2018. Truely portable, ultimate and precise cut, extensive use in rugged industrial and construction environments, as well as at home DIY. This list was compiled for one reason: to enable you to find the right plasma cutter for your specific needs without spending too much time and money. And because we’ve taken the time to research and simplify our findings for your benefits, you are guaranteed to find what you’re looking for on this page. Without further delay, here are ten plasma cutters you should consider buying if you want the most bang for your buck. Now, let’s take a closer look to each item. The Lotos LT3500 has a Pre Installed NPT Quick Connector, Portable & Easy Quick Setup.Here is a tool that many amateur metal artisans and DIY enthusiasts have a soft spot for. The compact 18-pound plasma cutter that is designed with simplicity in mind. Setting it up takes a minute or less, and using it is just as straightforward too. The cutter is powered by a regular 110V outlet, which you probably have at home or at your workshop. It can cut up to 2/5 of an inch cleanly and has a maximum severance thickness of 3/5 of an inch. These specifications simply mean that it is suitable for light tasks such as cutting through thin sheets of metal. One of the reasons many home improvement gurus love this plasma cutter is because it uses non-hazardous compressed air to cut. This is not only more cost-effective but is also a lot safer for use around the house. The perks of using this cutter include an easy setup process and low maintenance costs. Its compactness also makes it ideal for carrying around the workplace of transporting it from home to the shop. The only downside to this cutter is that its ground cable is just over 6 feet long. The good news is, you can easily replace this with a longer ground cable from your local hardware store. For budding DIYers and hobbyists, this is the perfect entry-level metal-cutting tool. It is also ideal for light home repairs and upgrades. Works well and was a great price for the performance. Together with its top brand F2C, it has good welding and cutting capability. This F2C 50AMP cutter has 60% of duty cycle and 85% of efficiency. It is suitable for all your welding and cutting ease. Many users got suprised of how strong F2C 50AMP can perform with a great value for money. Unfortunately, the user manual that comes with it is not very clear or helpful. Also, the quality of the accessories could be better, but considering the price, it isn’t much to complain about. Overall, it is a good cutting tool that is suitable for light to moderate DIY and repair tasks. Bear in mind that all F2C welding machines have wiring color code like brown as hot and blue as neutral. You can watch video on how to operate this plasma cutter. 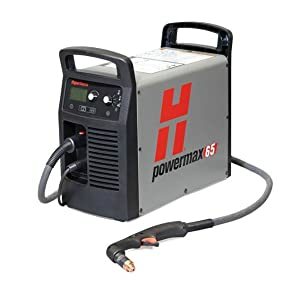 This plasma cutter has been available for purchase on Amazon.com since December 2015 and has quickly become one of the most popular products. Are you working in places with limited power outlets? If you are, then this plasma cutter is designed to make your life easier. Thanks to its dual voltage power supply, you can work even when there are limited power outlets in your shop. It uses high-frequency DC plasma to produce cleaner cuts faster and without leaving a mess. Many of its reviewers love its size and the carry handle that makes it easier to move around the workshop. It is powerful despite being so affordable and is conveniently designed for people without access to power outlets. Sadly, the ground lead that comes with it is disappointingly short, but you can easily replace this with a longer cable. Although its design appeals more to DIYers, the cutter is well capable of performing commercial tasks. Hobbyists and professional metal fabricators will find it to be very well-suit to their needs. One of the best 3-in-1 plasma cutters in the market. 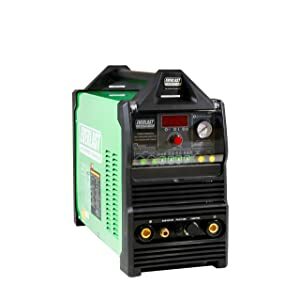 In addition to a 50A plasma cutter, buying this you will also get a 200A TIG welder and a 200A stick welder. The cutter features a non-touch pilot arc to cut through metal. This technology is far better since it makes it possible to cut through painted or rusted metal without producing a lot of slag. It can make clean cuts of up to ½” inches in thickness. As powerful as it is, its maximum severance cut is only ¼” inches thick. 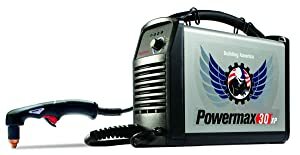 The plasma cutter is ideal for places with few outlets since it features an automatic dual voltage power supply. Buying this cutter will give you considerably more power for cutting through thicker pieces of metal. You will also be getting a handy multipurpose cutting and welding tool rolled in one. For many satisfied buyers, that is enough to earn the plasma cutter a 5-star rating. One downside you may have to contend with is buying expensive consumables. The designed of this Lotos LTPDC2000D plasma cutter allows amateurs to have an easy time working with it. However, its power and functionality would satisfy any professional. designed to undertake heavy tasks with ease. This AlphaCut AHP60 model allows you to get more work done at a time thanks to its 60 % duty cycle at max amp. The plasma cutter uses a continuous pilot arc to slice through painted, rusty, or rough metal effortlessly. In a nutshell, you can expect a lot more in terms of power and speed from this cutter. It is also packed with several handy features that make work easier for professionals. For instance, dual volt technology makes it possible to work where there are no outlets. On the downside, this plasma cutter is not for everyone due to its high price. If you’re looking to work with metal for commercial purposes, this is a solid investment for your business. The plasma cutter is powerful and sturdy, yet compact and portable for maximum freedom while working. Click here to read an in-depth review about this model! a compact but powerful multipurpose cutter/welder with very user-friendly controls and a long-lasting build. It is so easy to use that you only need to flip a selector switch to choose between cutting and welding modes. The plasma cutter first appeared on Amazon last year and has since become one of the top products in its category. A lot of this can be attributed to its power, which enables it to cut through metals as thick as 5/8 inches with ease. Other features enjoyed by several of its buyers include its dual voltage mode, its lightweight build, and its portability. Several users also enjoyed cleaner cuts and shorter work times thanks to its efficiency. What’s more, its multifunctional design gives it an edge over single-purpose plasma cutters. It is certainly the better option compared to other models, especially when it comes to sheer power. This plasma cutter has deservedly earned itself a perfect rating since it features the perfect combination of power and functionality. Considering its capabilities, its price tag is also very fair. Looking at its specifications, it is easy to see that it is a bit overpowered for simple DIY tasks. Hobbyists and professional metal artisans, however, will benefit a lot from this plasma cutter. This high-powered plasma cutter is the pick of the litter when it comes to industrial-class metal cutters. It combines the sheer power of a high-end cutter with the FineCut consumables to make more intricate cuts faster and with more smoothness. Out of all its features, we found its automatic voltage detection to be the most useful. Its invertor is capable of detecting voltages between 110V and 240V, and this makes it a useful tool to have. There is a lot to love with this plasma cutter, but a free carry case addition for its consumables is what takes the cake. The Hypertherm 088079 delivers much more power in its cuts without sacrificing overall cut texture. The free carry case and auto-detecting feature makes it easier to use even for beginners. If you’re thinking of buying this for menial DIY tasks, then prepare to be disappointed. There are much cheaper options than this if you simply want to perform some light repairs. On the other hand, if you’re in need of a heavy duty commercial metal cutter, this is definitely the best option for you. Watch this video for more visual review about this product. A multipurpose 3 in 1 unit offers a variety of multiple welding and cutting functions. If you’re in search of an affordable triple-function plasma cutter, you will get no better value than this. 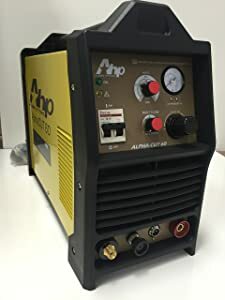 This affordable tool gives you a plasma cutter, TIG/stick welding, and arc welding, all for less than $400. At 32lbs, it is a bit heavy to carry around, but it’s still portable enough to be moved around with ease. The plasma cutter can cut up to 3/4 inches cleanly and has a duty cycle of 60% at 50 Amps on all its processes. For many DIY enthusiasts, this is a far more affordable option especially since it’s multifunctional. However, its power is relatively weaker than the others. For moderately sized tasks, this is a beast of a machine that will make light work of all your cutting projects. Professionals are better off investing in something a bit more suited to the industrial landscape. this cutter strikes a unique balance between ease-of-use and functionality. Many amateur and professional artisans have found the Everlast SuperUltra 206Si plasma cutter to be just the perfect tool for them. Despite being an entry-level multi-process unit, it comes with a high frequency 50 Amp plasma cutter that cuts through steel like butter. It has a clean cut rating of ½ inches, and a severance cut the thickness of 3/8 inches. Most of its appeal lies in its affordability. Customers love that they can use the TIG welder for fine welding repairs then switch to the high-frequency cutter with ease. The best part is, the cutter is exceptionally easy to operate, even for newbies. One slight downside is that the assembly is not great. Parts come loose or break away a bit too prematurely. This is a fixable downside, nevertheless. Whether you’re a professional or a hobbyist, the Everlast SuperUltra 206Si cutter is a prime tool. It is one of the easiest to use and quite capable of producing great results. This has a maximum clean cut rating of 1 inch, and satisfied customers have been flooding it with great reviews. It is not easy for products to achieve perfect ratings on Amazon, especially if they’re mechanical in nature. The Hypertherm Powermax 65, however, has been flooded with positive reviews from satisfied customers. Looking at its specifications, it is apparent that the cutter deserves every bit of the acclamation it has been getting. For starters, it has a maximum clean cut rating of 1 inch, which is quite impressive. It can also cut cleanly through metal that’s 1 ¼ inches thick, though not as cleanly. Luckily, it packs a lot more consumable power than the rest, allowing you to do a lot of work in a short amount of time. The manufacturers have managed to keep it nice and compact despite giving it industrial-class capabilities. Other than its impressive cutting power, the cutter is also very portable and light enough to carry by hand. One great benefit is that it comes with a 25-foot long lead—this is considerably longer than you’d expect from other cutters. All in all, the cutter is a robust industrial tool that can handle whatever you throw at it. It is suitable for commercial use and can last longer and work harder than the others. 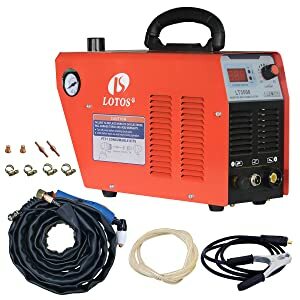 If a bargain is what you’re after, the Lotos L3500 35Amp Air Plasma Cutter is your safest bet. It costs just under $200 and is enough for DIY cutting projects. I recommend it for amateur hobbyists and newbie artisans since it is the most affordable. 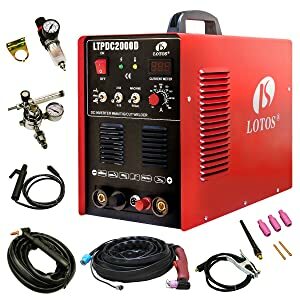 You may hardly find a cutter with better functionality than the Lotos LTPDC2000D Plasma Cutter. Despite having enough power and features to handle commercial tasks, it is quite easy to operate. This allows the user to take full advantage of its functions well. The 2017 Everlast SuperUltra 206Si Plasma Cutter is arguably the most compatible with a wide variety of uses. It is not every day that you come across an entry-level tool that would also suffice in commercial applications. Furthermore, it is a multifunctional device, meaning it also incorporates various welding tools. 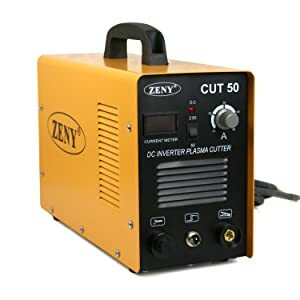 For that reason, this plasma cutter is what you should buy if you’re looking for something that is compatible with a wide range of uses. 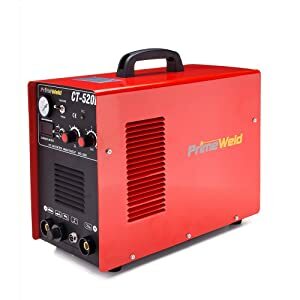 The PRIMEWELD Premium & Rugged 50A Air Inverter plasma cutter is the most frequently bought cutter in this list. 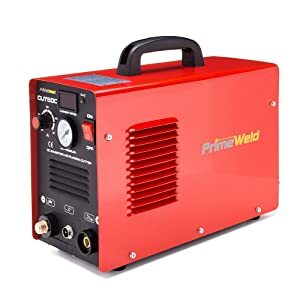 Reviews praise its ease of use, its flawless performance, its satisfactory cutting capabilities, its affordability with almost half price reduction, and good customer service from Primeweld folks. What to Consider When Buying a Plasma Cutter? The process of finding the right plasma cutter for your projects can be a lot smoother if you know what you’re looking for. Unfortunately, that is easier said and done. It is important to know the type of power outlets you have access to before settling on a cutter. Some cutters only support 110V, while others only work with 220V outlets. Ideally, a cutter fitted with a dual voltage power supply will work best in both scenarios. Alternatively, you can opt for a cutter that automatically detects and regulates the output voltage. These are often more expensive though. What thickness do you need to cut through? Do you intend to use the cutter on a daily basis? Is your cutter going to spend most of its time stashed away in the garage? These are three important questions that you should have answers for, in order for you to find the ideal plasma cutter. Although most cutters are enough to handle daily use, some are more durable than others. You don’t want to be spending an upwards of $1,000 for a tool you’ll be using once or twice a month. Similarly, you don’t want to start your metal fabrication business with a cutter that cannot handle heavy commercial use. To avoid needless spending, it is important to know beforehand the kind of projects you will be undertaking with your cutter. Some cutters are only able to make clean cuts up to a certain thickness. If the texture of the cut is an important aspect of your project, ensure you get a cutter that can comfortably make a clean cut in the thickness that you desire. While most cutters work just fine on a 110V power supply, some require a 220V power outlet to unleash their full potential. Pay attention to this to avoid buying a tool that doesn’t have enough power for your needs. A lot of cutters on the market come with dual or triple-purpose functionality. 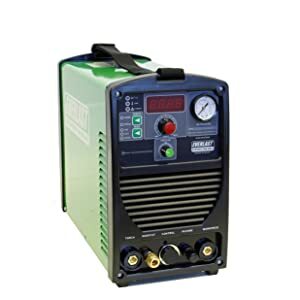 In addition to a plasma cutter, these machines also come with welders (TIG/stick/arc) to make work easier for you. If you just need a cutter, there is no point in buying a 3-in-1 plasma cutter. Similarly, if your project requires all three tools, you can save some money by buying a multifunctional unit. Keep in mind that cheaper multipurpose cutters won’t serve you as well as the more expensive options. Consumables are the parts and pieces of your cutter that eventually become worn out and need replacing. Most cutters come with their own consumables and are not compatible with other types of consumables. Pay attention to the price of consumables as these will become a regular expense as soon as you buy your cutter. One of two ways you can avoid these high maintenance costs is by buying plasma cutters with cheap consumables. Alternatively, you can seek out other compatible options that are more affordable. Purchasing a plasma cutter for the first time requires some research. Your workplace, the nature of your projects, and your budget are the three key factors that will help you decide which tool is ideal for you. Keep your budget low by focusing on cutters designed for light tasks. However, if you’re looking to expand your fabrication business, you should prepare yourself to invest in a good plasma cutter. Buy a multifunctional cutter if you can use an extra welder or two in your shop. Observe proper safety when using your cutter by ensuring that you plugged it into the right power supply. Using the right voltage can be crucial when it comes to getting enough power for your work. Lastly, good maintenance practices are what make your cutter produce consistent results and last longer. Never use consumables that the manufacturer does not recommend. This can lead to significant damage.